Hackwings are described as both large birds and flying lizards with saw-like beaks, both expressions which are often interchanged. They travel in large flocks and have the tendency to swarm when they feel threatened. They strike quickly in an attempt to wound or knock down their prey. They will fly off after wounding their victim, only to come back when the victim is almost dead from blood loss. Their victims are then ripped them apart with their saw-like beaks. They are hunted for their thick, supple, and strong leather hides for use in crafting armor and furniture. Armor made from their hides facilitates quick movement while still allowing the wearer to withstand brutal attacks, qualities which are invaluable to the Argonian hunters of the Black Marsh. They have a leathery "horn" on the top of their head that is referred to as a plumage. Despite appearances, Hackwings do appear to produce feathers. Hackwing anatomy is very similar to the cliff strider, and they may be possibly related to them. Some historians theorize the relation may have resulted from the Dark Elves raiding Black Marsh for thousands of years to bring back things they deemed valuable, such as slaves, livestock, and critters. They are found in Black Marsh. Evil witches who have been corrupted by dark nature magic. They are not to be confused with hagravens. 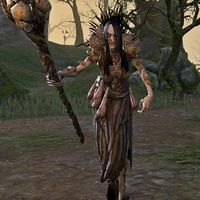 Hagravens are a horrific cross between an old crone and a bird. Usually they are extremely hostile to outsiders, but they retain the ability to communicate. They are equally dangerous up close or when casting spells from afar. 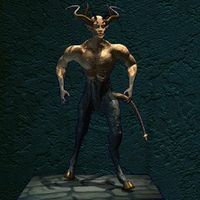 They can often be found in the company of Reachmen clans, who often revere hagravens as their Matriarchs and leaders, or dwelling in secret groves and lairs in the wilderness with other witches and hags. Few creatures match the cunning, depravity, and repulsiveness of the hagravens. They will take through savagery what they cannot win through guile. Hagravens were once witches, but have undergone a ritual, trading in their humanity for access to powerful magic, and the transformations they undergo infuse their entire beings with some element of that power. 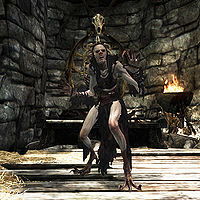 The Glenmoril Witches of Skyrim were known to be Hagravens. Haj mota are large amphibious creatures with a jagged shell and a powerful webbed tail. They are ambush predators and wait patiently in concealment until its prey comes into their attack range. They spew poison and are known to burrow underground. 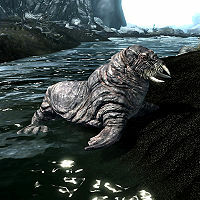 Haj mota mostly inhabit Black Marsh and the Verdigris Haj Mota can be found there, often hidden in algae-covered pools where its color acts as camoflage, but Haj Mota can also be found in the marshes of Hammerfell's Hew's Bane peninsula. The beasts are exceptionally hard to tame, although hatchlings are sometimes kept as pets. A long-eared animal that is often hunted. Herma Mora is sometimes depicted as a hare. Fierce, carnivorous, feminine humanoids with the wings of a bird. They have a reputation as furious creatures who kidnap, mate with, and kill human males. A common nuisance around the Iliac Bay area, particularly in Lainlyn, but found wherever there are rocky cliffs and crags suitable for their nests. Harpies live in primitive matriarchal group, have their own rudimentary language, and have even been known to communicate with mortals. 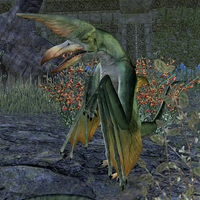 The festival of Riglametha celebrates the supposed creation of the harpies, when the Daedra worshippers of Lainlyn were transformed by a magic robe. 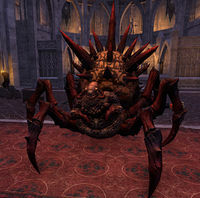 A powerful daedra with four arms that serves Molag Bal. 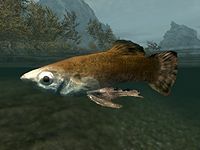 A type of fish that can be found in the plane-touched waters of the Imperial City. 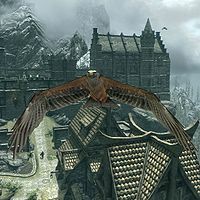 Hawks are birds found throughout Skyrim. They are hunted for their beaks, feathers and eggs, which can be used as alchemy ingredients. They are territorial animals who rarely venture far from their nests. Though predatory, they only hunt smaller birds and vermin. Trained hawks have been used to convey orders during battle. Undead variants are known as Bone Hawks. The ancient Atmorans worshiped the hawk, alongside several other animal totems. Nords often associate the goddess Kyne with the hawk, and are known to use stylized motifs of the bird in their architecture, crafts, and clothing. Similarly, the Khajiiti goddess Khenarthi is sometimes represented as a great hawk. The hawk's keen sight, accuracy, and rending claws inspired the sword-songs of the Ra Gada, and they were known to engrave their blades with the wings of the hawk. During the Chimeri exodus to Morrowind, Saint Veloth was supposedly guided by a great hawk in the sky. The town of Santaki was home to an order of knights named after the hawk during the Third Era. Helstrom Ancestor Lizards are tree-dwelling swamp lizards native to the Black Marsh and named for the city of Helstrom. 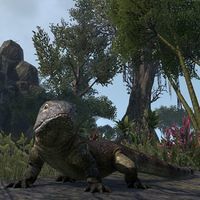 The Argonian allegory known as the Parable of Becoming states that the Hist found the humanoid forms of Men and Mer useful, and molded the form of the swamp's lizards after them to create Argonians. 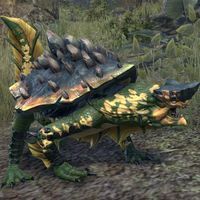 Scholars believe that the Helstrom Ancestor Lizard is the variety that Argonians were uplifted from. 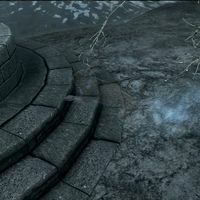 This theory appears to be an accurate account; circa 4E 40, the Argonian Mere-Glim received a vision while on Umbriel of life as a lizard, before the root and the taste of Hist Sap came and transformed both his body and mind. 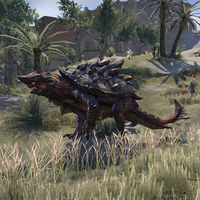 It is possible that the Helstrom Ancestor Lizard is also the ancestral form of various other creatures, including Bear-Lizards, Camel-Lizards, Guar-Lizard, Horse-Lizard, Senche-Lizards, and Wolf-Lizards, all of which are said to be descendants of "useful lizards" which were molded by the Hist. A Hemonculous is a blood wraith associated with profane blood ritual sacrifices. 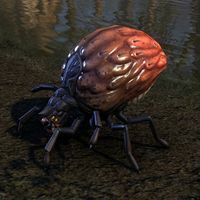 This article is about the Daedra. For the island of the same name, see Herne (place). These Daedra are slightly intelligent hunters associated with Mehrunes Dagon and Hircine. Possibly somewhat related to the Morphoid Daedra and the Scamps. 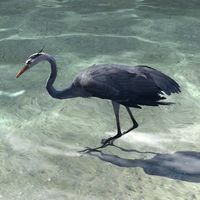 Passive birds that inhabit Hew's Bane, the Gold Coast, and Summerset. Histcarp are a common type of fish that can be caught in ponds, lakes, and other bodies of water. 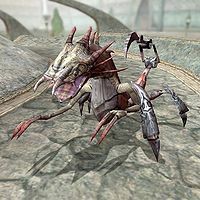 Grotesque hoarvor-like Daedra associated with Mephala. A hairless monkey-like creature which was used as an assistant by the chefs on Umbriel. They have long arms and legs, very long, thin, delicate fingers, huge toothless mouths, large green eyes and very simple language skills. A strange being created by a high level wizard who has somehow combined the properties of certain spells with parts of various demons. These creatures are often set to guard areas, using their ability to fly to patrol corridors. May be related to imps; not to be confused with hemonculous. An amphibious creature, with three tusks surrounding its mouth, two long flippers and a strong tail. They are native to Solstheim, Skyrim, and northeastern High Rock, and are actively hunted by the Skaal for their horns and meat. Although usually passive, they will attack when provoked or during mating season. Lake Fjalding is the mating grounds for the horkers of Solstheim. 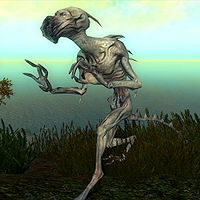 The second sign of the Bloodmoon Prophecy involves dead horkers all along the coasts of Solstheim. A domesticated quadrupedal animal used for travel. They may occasionally be eaten, but this is considered in bad taste. See also: Bay horse, Black horse, Chestnut horse, Paint horse, and White horse. 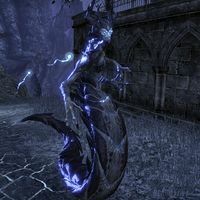 Hulking Fabricants are horrid creatures created by Sotha Sil, resembling an undersized dragon with six legs and a tail stinger. They seem to be more strong than fast and attack with claws, fangs, and tail. 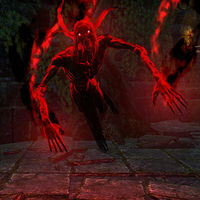 The Hunger is one of the many daedric servants of Daedra Lord Boethiah and is known for its long tongue, demonic appearance, and uncanny ability to quickly destroy its opponents' armor and weapons. The Hunger uses its long tongue to attack as well as its claws and spells. Sheogorath allows them to roam his realm as pets, as they appeal to the demented side of his personality. Their tongue is notable among alchemists for being used as an ingredient in potions to cure diseases and poisons. Huskies are a strong breed of dog, capable in battle against deadly beast and warriors. 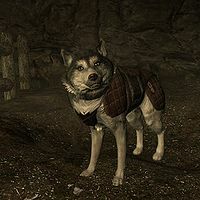 They are often bred to accompany members of the Dawnguard and the Vigil of Stendarr. Special armor is forged for huskies giving them an edge in combat. ^ Felldir the Old's dialogue in Skyrim. This page was last modified on 22 April 2019, at 17:11.